Music and video can be controlled via universal remotes and touch panels, as well as IPADs. We offer a range of audio visual services, as detailed below. Clutter: Reduce clutter and the need for entertainment cupboards, by placing Foxtel and other devices in a central rack away from sight. 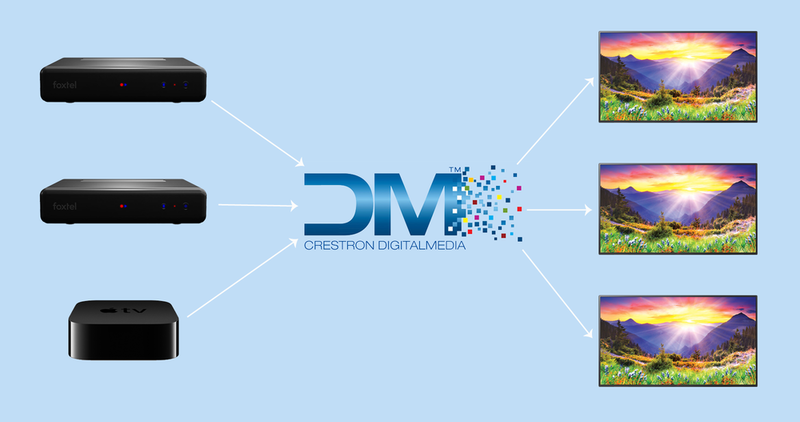 Pioneers: Crestron were first to market with video over data, working directly with the company that invented the concept. Picture Quality: The Crestron system offers full bandwidth 4K video for the highest quality available on the market. Design: Hardware is based on enterprise quality design & engineering. A centralised music system such as Sonos, allows you to easily listen to music throughout your house. Crestron touch panels fully support the Sonos software, allowing you to use the same app as you do on your phone and tablet. Party Mode: Sonos zones can be grouped together for parties. Clutter: Reduce clutter and the need for entertainment cupboards, by placing Amplifiers in a central rack away from sight. Flexibility: Various options are available, including ceiling mount speakers, portable speakers that can be carried around the house, and sound bars for televisions to increase the quality of their audio. We offer a complete theatre consultation, design and installation service. Latest 4K projectors and projection screen technology. Latest 7.2.4 audio designs, including 3D audio. Easy to use Crestron remote for control of the theatre. Sound conditioning panels to ‘treat the room’. Advice on fabrics and colours. A universal remote control is at the heart of any easy to use audio visual system. It’s function is to simplify the control of your TV, Blu-ray and other devices to allow 1-button on/off control. It can also control other automated systems such as lighting and blinds. Standard Batteries last 6-12 months. Includes a Dock and Chargeable Battery. Landscape speakers can be hidden in the garden and are suitable for outdoor areas from 200-450 sqm. Even sound fills large spaces. 8 or 16 Speakers & 1 or 2 Subwoofers operate from a single amplifier. A single cable is run between the speakers, and is buried in the garden. Sound in radiated within the property, rather than away, reducing disturbance to your neighbours. Marine grade, fully waterproof design.